We're helping usher in spring with a couple bright and cheerful quilts this week! 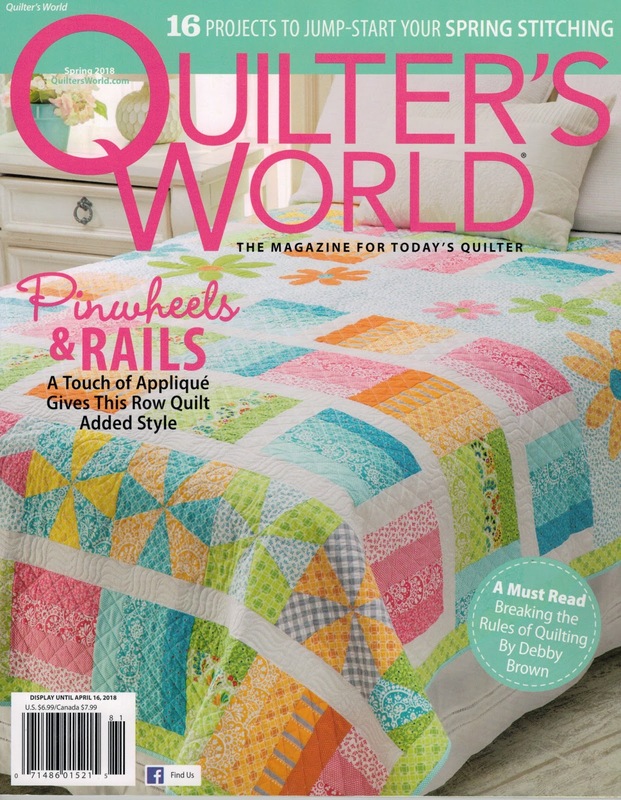 First ups is the Pinwheels & Rails quilt designed by Melanie Greseth and Joanie Holton of Tailormade by Design, featured in Quilter's World magazine. 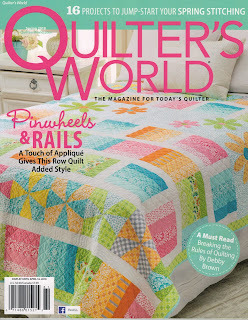 They used a curated palette of prints from Nancy Halvorsen's Bree collection to create Pinwheels & Rails, a quilt that absolutely "sings spring." We asked Joanie to talk about the quilt design. How did you choose this more limited palette from Nancy’s collection? We chose the pastel palette purposefully. Nancy’s pastels aren’t baby pastels—they’re still vibrant, and we wanted to highlight that. For the rail fence blocks, we chose four prints—light to dark—from each of four colors. Tell us about the two different styles of rail fence rows. Traditionally, a rail fence design is stacked to create a zig zag effect. We didn’t want that to distract from the pinwheels and applique rows, so we added a neutral lattice to separate some of the blocks. The pinwheel blocks add playfulness to your design. We alternated placement of the stronger and lighter colors in the pinwheel blocks to add variety. We also used half blocks on each end. Instead of having everything so symmetrical, the half blocks throw in a little twist. People are afraid of half blocks and they don’t need to be! Your flower appliques are adorable! Thanks! We wanted a simple applique in a few different sizes that had the feel of the fabric line. These petals are accessible for all quilters—easy to do—but also cute. 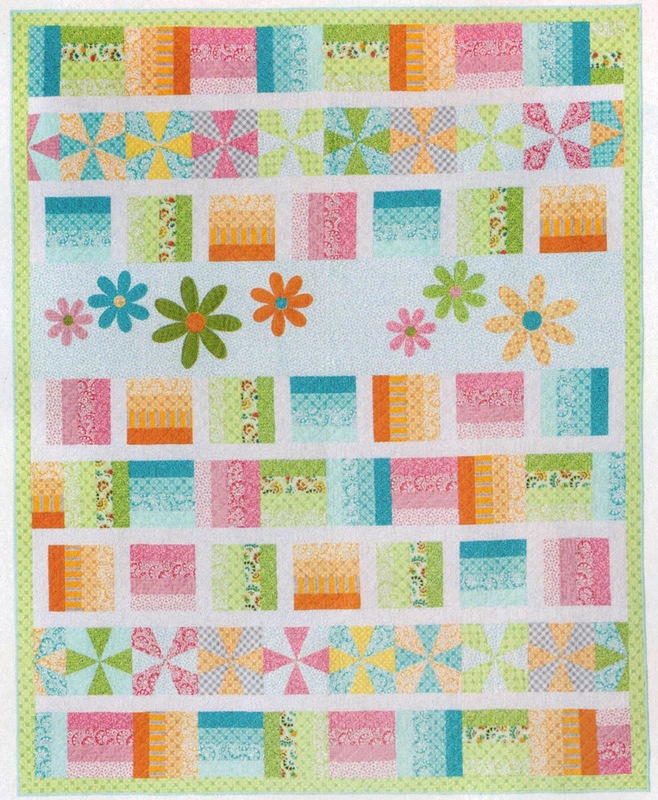 With so many fun prints to choose from, how did you pick the border fabric? Choosing that was fun. It was actually a challenge—deciding how we wanted the quilt to feel. 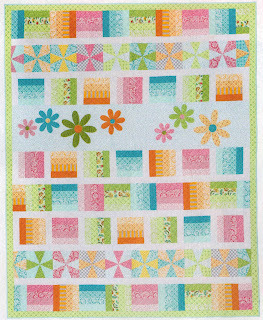 We tried blue, and orange, but the green did the best job of framing the quilt center without overpowering the rest of the design. What I ended up liking best is how it came together. It’s a soft quilt, but it’s not a baby quilt. The colors are saturated. It’s really lovely. It really sings spring. 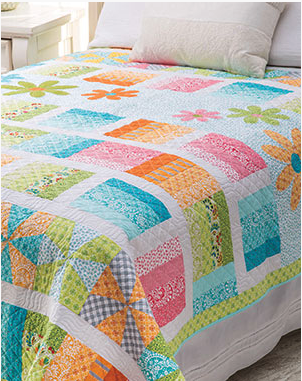 Very Springy quilt! Awesome colors! What a lovely quilt! Reminds me of rainbow sherbert.